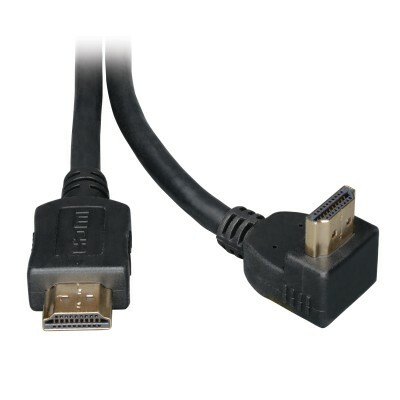 Tripp Lite's 1.83 m High Speed HDMI ( High Definition Multimedia Interface ) cable with right-angle connector allows interconnection between digital display devices and digital source devices, where space constraints are an issue. Supports iPad2 Video Mirroring when used with Apple Digital AV Adapter. HDMI assures that the best audio/video signal is always sent from the source (HDTV signal, Blu-Ray Player) to the display (Projection Television, LCD, Plasma, etc.). It does this by allowing uncompressed video and multi-channel audio data to be input to the display device through one single cable. An HDMI connection allows input at high rates of speed, up to 18 Gbps.